Final Collapse of Halemaumau on August 2 at 11:55 pm No Earthquakes Felt Since This Occurred. The Keauhou Ranch wildland fire more than doubled overnight and is now 3,205 acres – most of it within Hawaiʻi Volcanoes National Park. Additional firefighters from the mainland and Hawaiʻi have arrived and are assisting with suppression efforts. NPS Photos: one shows NPS fire crew on the ground fighting fire (Wed., Aug. 8) and an aerial showing flames in the park and approaching Kapapala Ranch (Tues., Aug. 7). KILAUEA REMAINS QUIET. This quiet is a significant departure from the pattern of episodic seismicity and continuous deformation over the past several months, with very low rates of seismicity continuing today. Deformation at the summit as measured by tiltmeter and GPS instruments slowed and virtually stopped between August 4 and 5. This view of Halema‘uma‘u is toward the southeast. 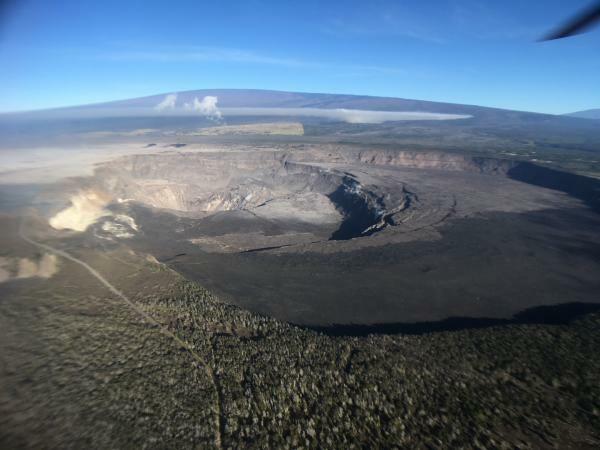 High- elevation view of Halema’uma’u and the Kilauea Crater with Mauna Loa in the background. HVO and NPS Jaggar Museum are located on bluffs at the far side of the crater in the center of the view. From mid May until early August 2018. 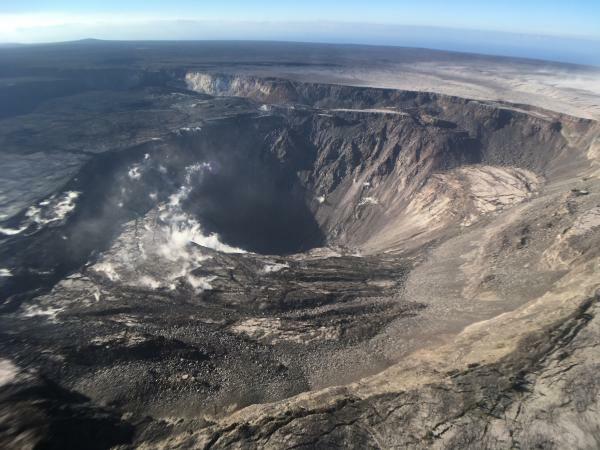 The depth of Halema’uma’u Crater in Volcanoes National Park has more then tripled. 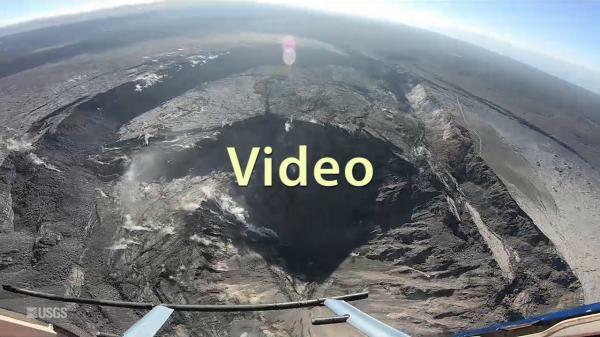 It’s diameter more than doubled as magma from Kīlauea’s shallow summit reservoir moved into the lower East Rift Zone. Evidence of subsidence is visible in this video, taken during an early morning helicopter overflight on August 6, 2018. 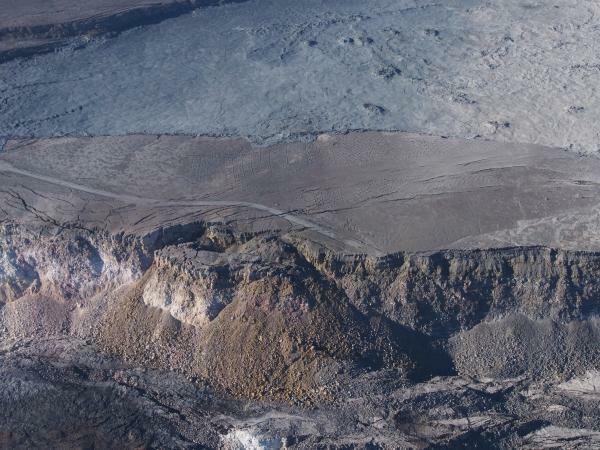 Cracks and down-dropped blocks of the caldera floor have slumped into Halema‘uma‘u. At the base of the steep crater walls are piles of talus (rock fragments) shaken loose during previous summit collapse events. Areas of persistent steaming within the crater, in the vicinity of the former lava lake, are also visible. This photo shows a portion of the Crater Rim Drive that led from the east to the Halema‘uma‘u parking area, which slid into the growing crater weeks ago. Note a slump block located below and near where the road ends at Halema‘uma‘u. The September 1982 lava flow can be seen in the top of the photograph.